Raytheon and Northrop Grumman have been awarded Defense Advanced Research Projects Agency contracts to develop drone swarms for urban combat environments. DARPA’s OFFensive Swarm-Enabled Tactics, or OFFSET, program, aims to equip small infantry units with swarms of 250 or more robotic aircraft and ground vehicles. Under the Phase I research contracts, Raytheon BBN Technologies and Northrop Grumman will lead teams to develop easily deployed and monitored platforms to bolster forces in urban canyons. 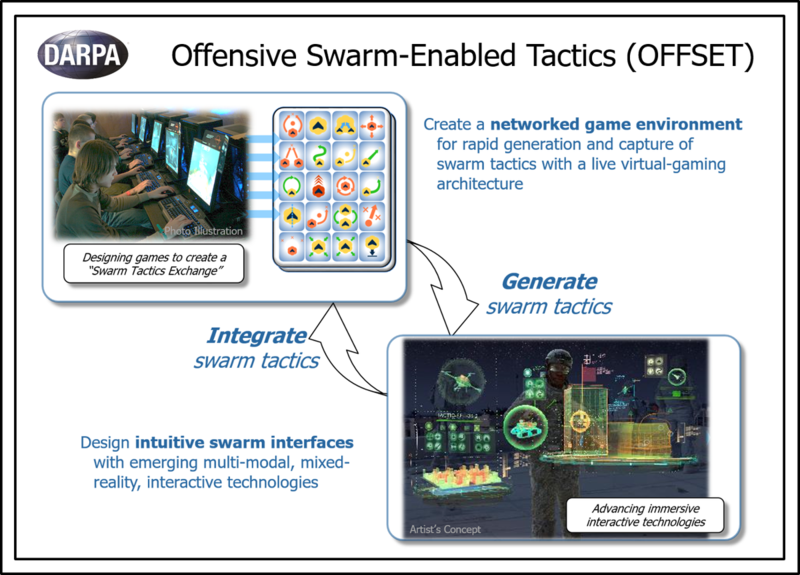 “Each team will serve as a swarm systems integrator tasked with designing, developing and deploying an open architecture for swarm technologies in physical and virtual environments,” said a DARPA news release. In addition, every six months DARPA will invite “sprinters,” or third parties, to work with the agency and the two contractor teams. The sprinters will focus on swarm tactics, swarm autonomy, human-swarm teaming, virtual environment and physical testbed.